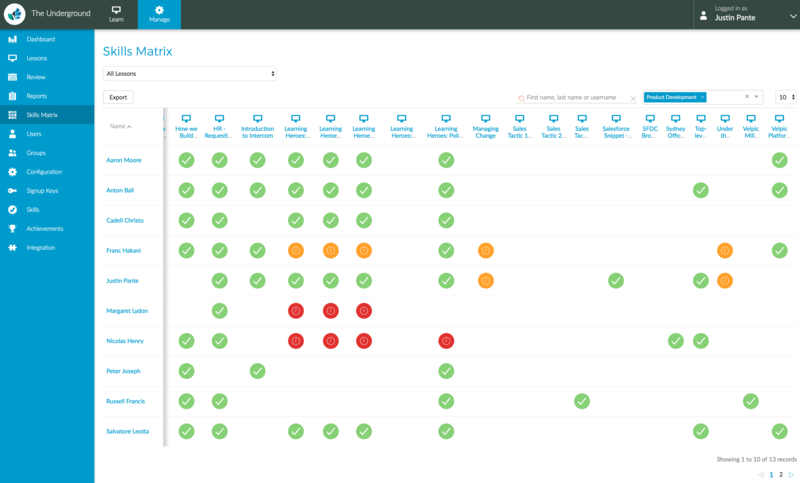 The skills matrix is a great way for Supervisors and Administrators to see the status of your organisation training and skill status in one place. Supervisors view on this data is limited based on the groups or users they supervise. Once you've selected the type you can filter the matrix by searching for a user by name or selecting groups. For the skills and achievements, when you filter by groups, the Skills Matrix columns will also be filtered to show the skills or achievements that are only available to those groups. If you want to see all, you can select the checkbox next to the group filter selector. Once you've selected a view of the skills matrix, you can choose to export this to CSV. To do this, simply select the Export button. Your report will be available for download once it completes and it will also be emailed to you.